In ancient times and in the Middle Ages, borage was known for its cooling quality and refreshing flavor and was said to make men merry. Also referred to as the “herb of courage”. 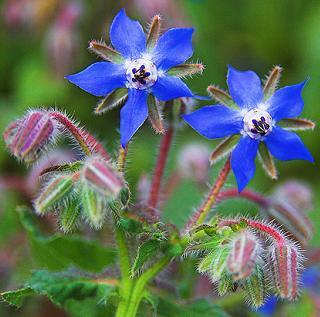 There is some controversy over the source of the borage name. Some say the Latin Borago is a corruption of corago, from cor, the heart, and ago, I bring. Others point out that a connection is apparent between the plant’s name, its hairy appearance, and the low Latin term for flock of wool, burra, and its derivatives, borra (Italian) and bourra (French), both of which mean much the same thing. Still a third opinion suggested comes from an apparent connection between the Celtic term, barrach, which means “a man of courage”. Ancient Celtic warriors drank wine with borage to give them courage before going into battle. Called Langue de Boeuf and also bugloss, one signifies Ox-tongue in Greek, and the other signifies the same in French. LiveStrong.com: How Does Borage Oil Help the Body?